You are currently browsing the category archive for the ‘United Kingdom’ category. ‘Mony a Pickle’ is a compilation film for the British ‘General Post Office’, made by several directors. In his contribution Norman McLaren turns to his homeland Scotland to tell a story about a poor young couple, still living with their family, but dreaming of a place of their own. The dream sequence transforms the poor and crowded living room into a new stylish one, and uses a lot of stop motion of furniture. There’s a humorous sequence in which the two lovers argue about the legs of a table, which change back and forth for our very eyes. Unfortunately, in the end a little brother scatters all their dreams and puts them back into reality again. ‘Mony a Pickle’ is a nice blend of live action and stop-motion. The stop motion sequences in a long tradition of furniture animation, which started with Stuart J. Blackton’s ‘The Haunted Hotel’ (1908). McLaren’s animation is not too remarkable, but effective, and completely in service of the story. ‘Dilemma’ is one of the earliest computer animation films ever, and probably the first fully digitally produced one. Unfortunately it is a rather vague, non-narrative film, which seems to try to tell us that we could better use the human mind for art and science than for violence and war. ‘Dilemma’ doesn’t make any use of 3D effects, but stays in a very graphic 2D design style. The only clear additions of the computer are the very primitive morphing sequences. Outside these, the animation is very limited. The film uses the same static head over and over again to illustrate the human mind. The designs are rather ugly, and so is the synthesizer music. Moreover, the filmmakers seem to want to tell us too much, resulting in a rather tiresome film, in spite of its avant-gardism. 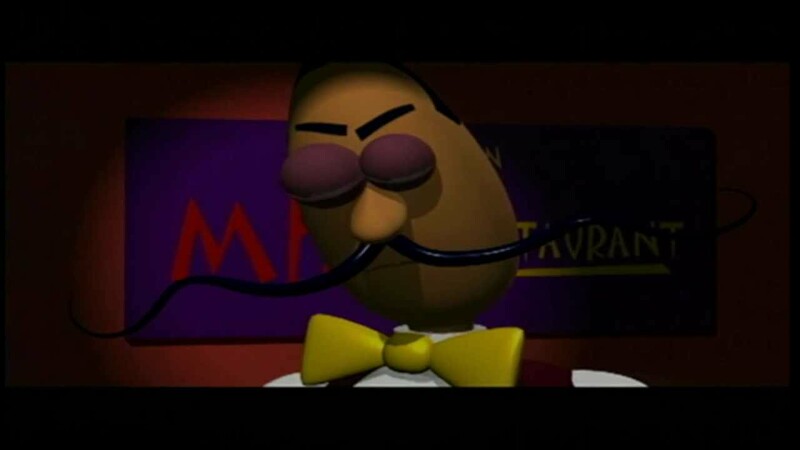 It was to other film makers to use the full potential of the new technique of computer animation. ‘Minotaur & Little Nerkin’ is a curious 2d computer animation, which looks like it is designed for children. However, its story is rather black. The film features a minotaur who lurks a duck into his home to eat a captivated human hand, only in order to eat the duck himself. Remarkable for its morbid humor and original technique, it is nonetheless an ugly and unfunny film, that fails to entertain, let alone impress the viewer. 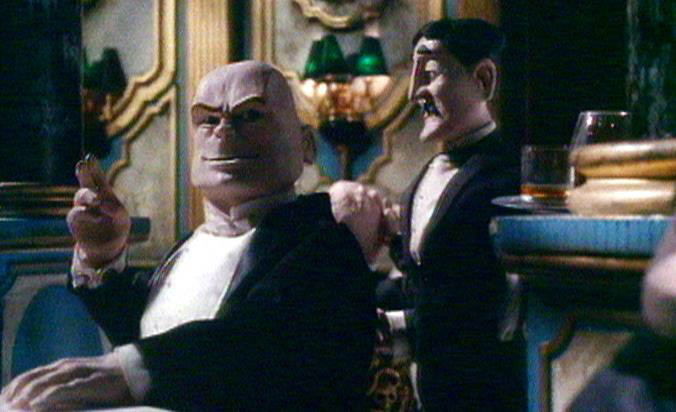 ‘Al dente’ is another film by computer animation pioneer at Aardman, Mark Brierley. This short film looks even more primitive than ‘Owzat’ from the previous year. It doesn’t feature any backgrounds of notice, and the main character, a grumpy waiter who has to serve a vegetarian meal at a meat restaurant, looks primitive and unimaginative. The film is utterly mediocre and, like ‘Owzat’, probably would never have been released were it not an Aardman production. 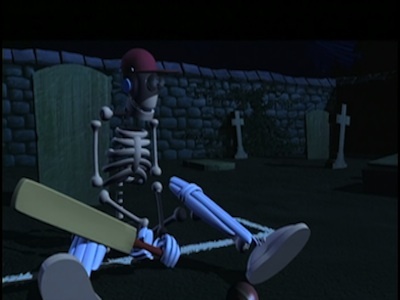 In a graveyard a skeleton plays cricket with some unwilling ghosts. ‘Owzat’ is Aardman’s first endeavor into computer animation and it pales when compared to Pixar films from the same period. The designs look hopelessly primitive, the animation is stiff and the colors are rather ugly. As the film is quite incomprehensible, slow and unfunny, one wonders why it was made in the first place. It looks like a study, and it probably wouldn’t have been released if it had not been an Aardman production. When she hasn’t paid her washing machine, a girl’s aunt has to go to hell. However, she soon returns as a zombie to fetch her handbag. The devil tries to take her once again, this time disguised as the handbag. Atypical for the Aardman studios, ‘Not Without My Handbag’ features puppet animation and hardly any clay animation. It’s a highly designed film, using stark colors, extreme camera angles and expressionistic decors. 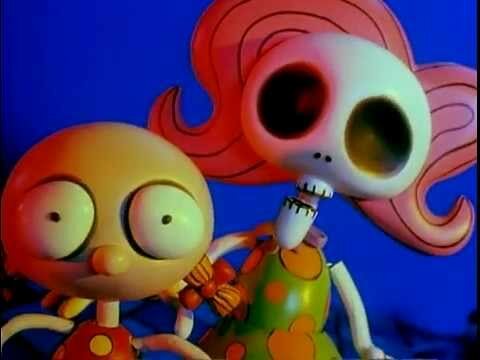 Its unique style is somewhat akin to that of Tim Burton, but is even more idiosyncratic. Despite its horror theme, the film is more lighthearted than the earlier Aardman films ‘Adam‘ (1991) or ‘Loves Me, Loves Me Not‘ (1992), because of its zany humor and matter-of-fact dialogue. For example, when her aunt returns as a zombie, the girl suddenly turns to camera and says proudly: “My auntie is a zombie from hell!”. ‘Not Without My Handbag’ is a modest masterpiece: it’s unpretentious, but it combines originality with virtuosity. The animation of the evil handbag is particularly good. Director-animator Boris Kossmehl later moved to 3D computer animation, performing character animation for Dreamworks’ ‘Antz’ and ‘Shrek’. A gentleman uses a flower to determine whether his girl loves him or not. The contrasts between happiness (she loves him) and pain (she loves him not) get more and more extreme during the film, providing unsettling images of terror. 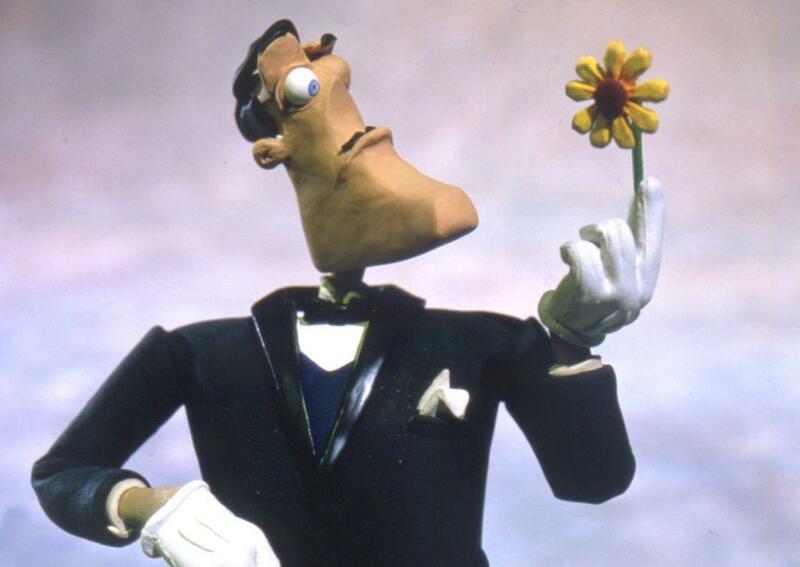 Like ‘Adam‘, ‘Loves Me, Loves Me Not’ is an example of dark humor, typical for the Aardman Studios at the time. The dark humor is typified by the screams of pain the flower exclaims, when its petals are removed, by the highly disturbing soundtrack and by the images of suicide and threat. 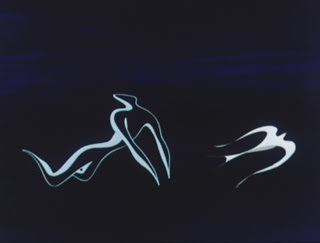 Combining virtuoso clay animation with some cel animation, the film is a technical masterpiece. It also features some great silent comedy, and especially the deft gestures of the Clark Gable-like gentleman are nicely done. A giant hand creates a man on a tiny planet. His creator orders the man around, but the man soon discovers his barren sphere is too small to do anything, and that he is stuck to it. Luckily, in the end the creator grands him a companion, which turns out to be a penguin (iris out). 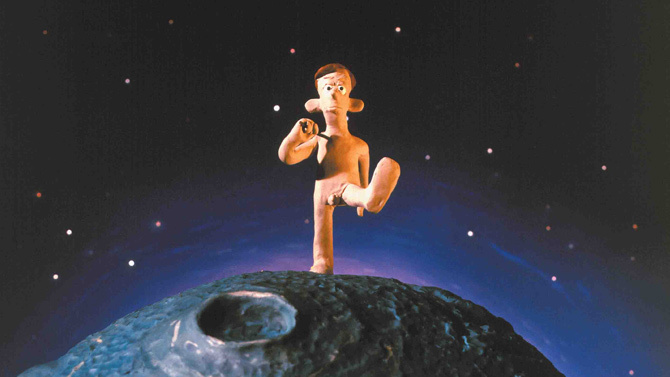 ‘Adam’ exploits the dark humor typical for the early Aardman films. Its claustrophobia feels real and disturbing, and the film raises inevitable questions about existence and purpose of life. And though ‘Adam’ contains great silent comedy gags, the film is rather unsettling overall. Unfortunately, the film’s comedy is hampered by Stuart Gordon’s rather ugly electronic music. However, Lord’s animation is superb throughout, and a prime example of the more comedy-driven animation style the Aardman studio took from 1989 on. 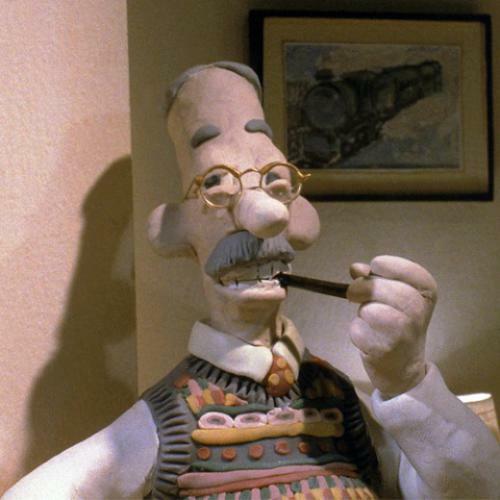 With ‘War Story’ the Aardman studio returned to their original lip-synch experiments with real dialogue. This time they use an interview with one Bill Perry, an old man who tells his memories of his life in Bristol during World War II. Unlike the ‘Animated conversations’ series, however, there is room for goofy images exaggerating the tall tales of the voice over, which involve a slant house and lots of coal. The film’s images are very tongue-in-cheek, yet this film once again suffers from a bad soundtrack, and the old man’s mumblings are at times very difficult to follow, indeed. 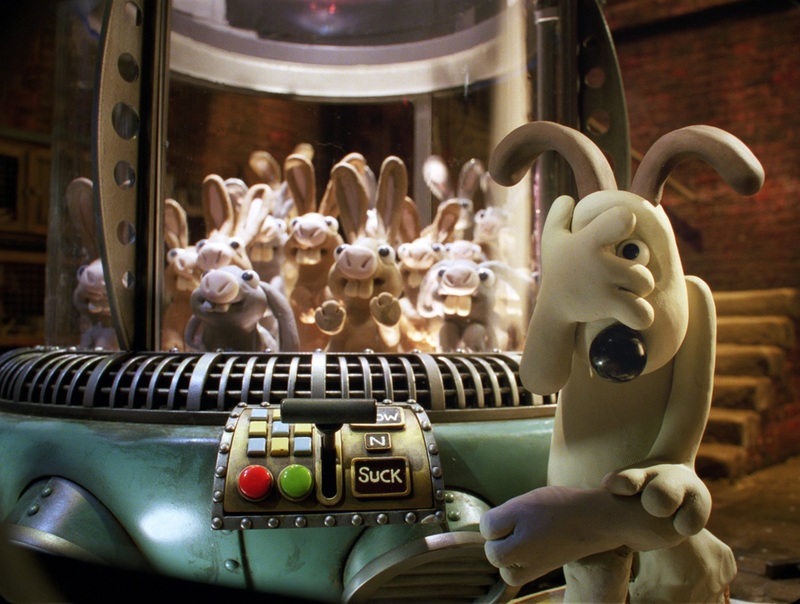 The blending of real interviews with original and humorous images would be perfected in ‘Creature Comforts’ by Nick Park, who also animated on this film. In this sense ‘War Story’ is an important step towards Aardman’s mature style, which was to become less serious, and more cartoony, and consequently, more commercially successful. The film uses highly original and very stylized designs, and jabbering dialogue to an alienating effect. Its claustrophobic labyrinth setting alone is unsettling. The film is not heavy-weighted, however, but keeps a light sense of humor. It also features a flat dog that was to become the direct ancestor of Rex the Runt. 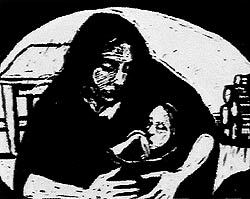 ‘My Baby Just Cares For Me’ was Aardman Studio’s second video clip, after ‘Sledgehammer’ for Peter Gabriel (1986). ‘My Baby Just Cares For Me’ is not quite as elaborate, however. It’s a sweet little video in mostly black and white. It’s set to Nina Simone’s 1958 recording of the song, which was reissued in 1987 after being used in a successful commercial for Chanel No.5. 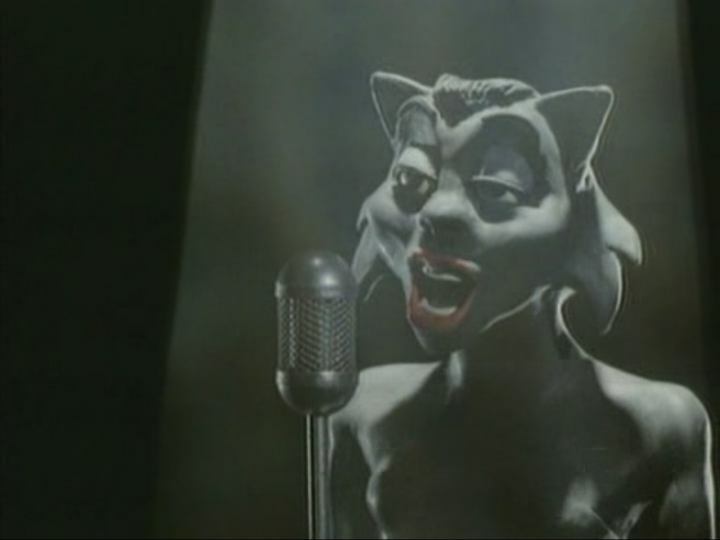 The clip features cat characters, including a black female cat singer, and a white cat who’s in love with her. It also features some live action footage showing details of a piano, brushes on a snare drum, and a double bass. The smoky nightclub atmosphere is captured very well, and the animation, joyful if a little crude, matches the song perfectly. 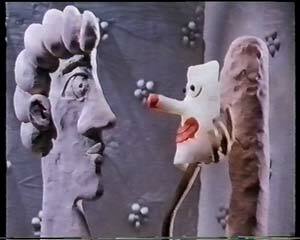 The result is one of the most enjoyable little stop motion films of the 1980s. ‘Babylon’ is an early Aardman film criticizing weapon trade. Unfortunately, despite its sympathetic message, it’s not a successful film. In it we watch a meeting of weapon dealers. During this gathering one of the guests, a bald Russian-looking guy, is growing in statue to a gargantuan size until it explodes into a flood of blood, destroying all the other guests. ‘Babylon’ impresses with its many detailed human-like plasticine puppets, its virtuoso stop motion animation and its elaborate set. But it suffers from slowness, ugly sound design and a very bad soundtrack, involving an all too long speech by the chairman of the weapon dealers. The end result is too tiresome and too vague to impress. ‘Feet of song’ is a non-narrative film about dance and Russell’s solo debut film. It uses semi-abstract human forms, akin to those by painter Kazimir Malevich. The human forms feel both futuristic and African at the same time, and have a timeless appeal. The images get more and more abstract as the film progresses, but the sense of dance is never lost. ‘Feet of Song’ features African-sounding world music by Charlie Hart, but the music is in service to the beautiful images, not the other way round. Made for Channel 4, ‘Feet of Song’ is a prime testimony of Erica Russel’s unique style, clearly influenced by Oskar Fischinger, but firmly rooted in her South African and dancer background. Unfortunately, Russell made only two other independent films, ‘Triangle’ in 1994, and ‘Soma’ in 2001, devoting most of her time to commissioned work (her images for example appear in the Madonna video-clip ‘Dear Jessie’ from 1989). 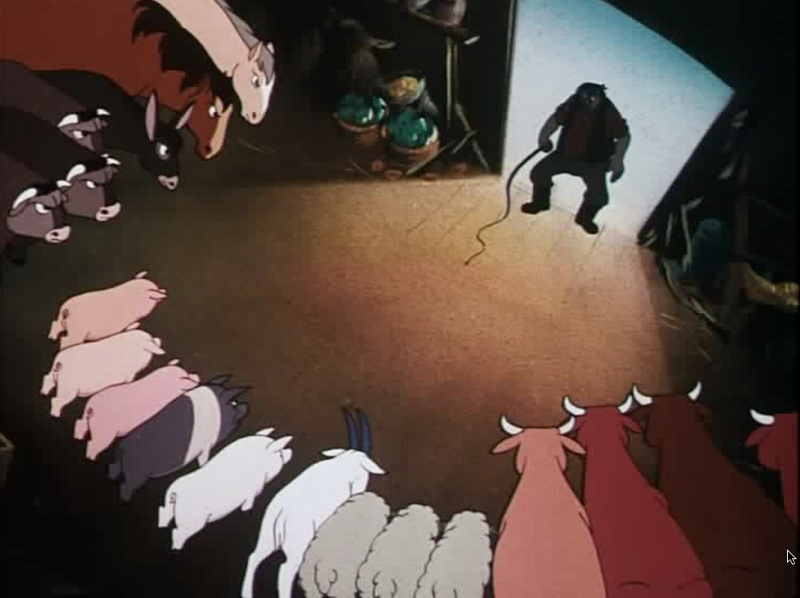 Based on George Orwell’s famous fable (published only nine years before), Animal Farm is the first animated feature made in England, it’s one of Europe’s first feature films, and it’s undoubtedly among the masterpieces of feature animation. 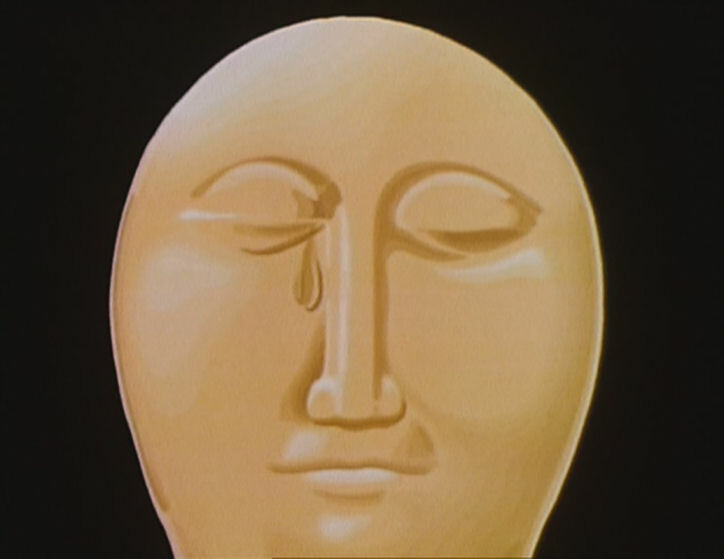 The film falls into the tradition of Disney-style semi-realistic cel animation. However, it sets itself apart from the Disney tradition in its grim and political story, its lack of sentimentality and its open depiction of cruelty and violence. Moreover, the backgrounds are bold oil paintings, with visible brush strokes and darker colors than any Disney film had ever shown. Nevertheless, the realistic and wonderful animation of the animals pays some depths to the Disney tradition (watch the Silly Symphony ‘Farmyard Symphony‘ for example), greatly helped by the presence of ex-Disney animator John Reed. The film even contains one sweet character for comical relief in a little duckling who tries to keep up with the other animals, echoing the turtle in ‘Snow White and the Seven Dwarfs’ (1937). However, when the story turns particularly grim, with the killing of the Trotsky-like pig Snowball by Napoleon’s dog henchmen, we do not see this cute character again. The assassination of Snowball is the first of several alarming events in which the animals’ revolution is betrayed. The most disturbing of these is Boxer’s ride to a certain death. This scene is the emotional highlight of the film, and it creates strong feelings of outrage and alarm, still. The horror on the face of his friend Benjamin is very well captured, and moves to this day. Using a voice over and evocative music by Hungarian composer Mátyás Seiber, the film retells Orwell’s story effectively, using only Orwell’s own words. Its only strong deviation from the book is its ending. Where Orwell’s novel ends with the Stalin-like pig Napoleon’s regime installed, the film ends with yet another revolution – some wishful thinking that in the real world never quite came true until the late 1980s, when encouraged by Gorbachev’s perestroika, the people all over Eastern Europe revolted against their communist oppressors.